Indian Wedding Décor Themes That Made Us Swoon! Your wedding day A.K.A. the most special day of your life is when you want to look your best. It’s a time when you get to be the princess bride you’ve always dreamed of being and most importantly it is the day you vow your love to your forever friend! With all the happiness and love already flowing around, we know brides like you want to add that extra touch of sparkle and colour to make your wedding stand out from the rest. And we know the secret way to do exactly that; listen up close! To make your wedding day extravagant not just for you but also for that Delhi wali aunty ji, who will talk about it for eons to come, the best and simplest way is to set a colour theme. Play around with a set of colours that complement the mood and setting you’re planning to have your wedding in to make your big day as beautiful as you want it to be. Hence, we’ve put together five of our favourite wedding colour trendswe spotted from our Real Weddings in 2015. So, without further ado, read up and be inspired! Enjoying proximity to nature, the sound of crashing waves and the natural orange-yellow hues of the sun –Beach weddings always make a perfect setting for a romantic wedding ceremony. Here, Amish and Anika picked an unusual combination of orange and grey; using it throughout every element of their wedding. The beach-front wedding decor, the mandap and even the bride and groom’s outfits – every element had this gorgeous colour. Take a look at more photos from this Real Wedding here. For the Brides-to-Be:Use the colour scheme not only for the flowers and drapesbut also incorporate it in your attires! How strikingly beautiful are these shimmery gold Grecian-styled bridesmaid dresses! We love how Rebecca and Vikram opted to go for something so out of the box. While most Christian brides go for solid coloursand stylish designs, Rebecca went the other way around. The all-over gold draped décor with warm yellow fairy lights went perfectly with her bridesmaid’s sparkly gold dresses. The sparkly dresses teamed with the boys’ carbon black suits complemented each other excellently. For the Brides-to-Be: Experiment not only with colours and designs but also with the textures. The texture of a garment or drapes can act as the highlight, and you won’t need extravagant designs to make your colour-coordinated outfits/décor pieces look great. Floral walls have become the talk of the town since the Kim-Kanye wedding, and we can guarantee that flowers never disappoint! And flowers in shades of pink and peach? Even more! 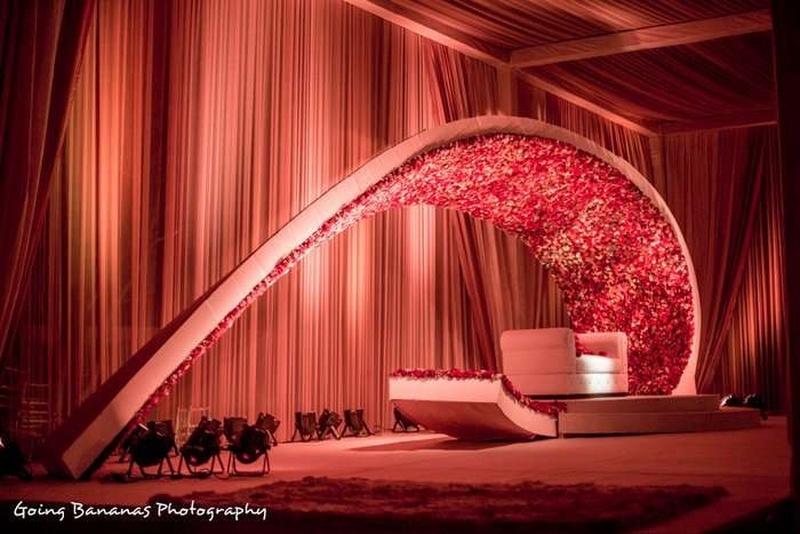 Javed and Elisha decided to take their wedding decorup a notch with their view of a classy Walima. A silver embossed frame held gracefully fallen pink drapes with crystal glass chandeliers and an ellipse shaped wall with an abundance of fresh flowers. For the Brides-to-Be: If there is one sure shot element that can make your wedding an elegant affair, it has to be flowers, pink flowers! Flowers and Weddings are like the two sides of one coin; one can’t do without the other. Why not take it to the next level with a never-seen-before floral arrangement with lots of pink. If you asked us our favourite Indian wedding flower, it would undoubtedly be Marigold! Available in hues of yellow, orange and white, marigold flowers are versatile as they can be used foreverything between haldi ceremonies to the wedding décor. Neeraj and Poojawent all out desi with their flower choice that perfectly matched their green, white and yellow theme. Bright colourslike these give the entire ambiance a fresh feel. For the Brides-to-Be: Opt for fresh colours like these if you’re hosting your wedding in a banquet hall or an indoor space. Use of darker colours will dampen the mood; whereas, vividhues will give a brighter, scintillating feel. We love this red-hued wedding which was all things traditional and classy. Whether it was the gorgeous bride’slehenga or the mandap itself, this shade of traditional red did not fail to add a touch of ethnicity and elegance to Amit and Payal’s wedding. Their drapes were adorned with sparkling lights and jasmine flowers that looked absolutely ravishing. For the Brides-to-Be: If you’re the kind of bride who likes to play it safe, then this shade red is a perfect pick for you. This hue signifies ethnicity, love and all things traditional. Pair this colour with white for a more classic vibe or gold if you want to go for something more royal.